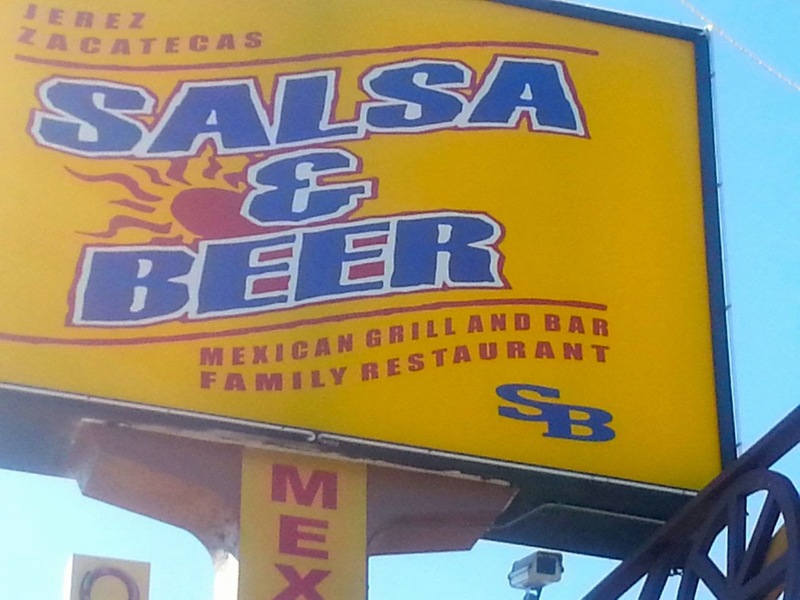 Yes, salsa & beer sounds like a winning combination, but that’s actually the name of a Mexican restaurant in North Hollywood. 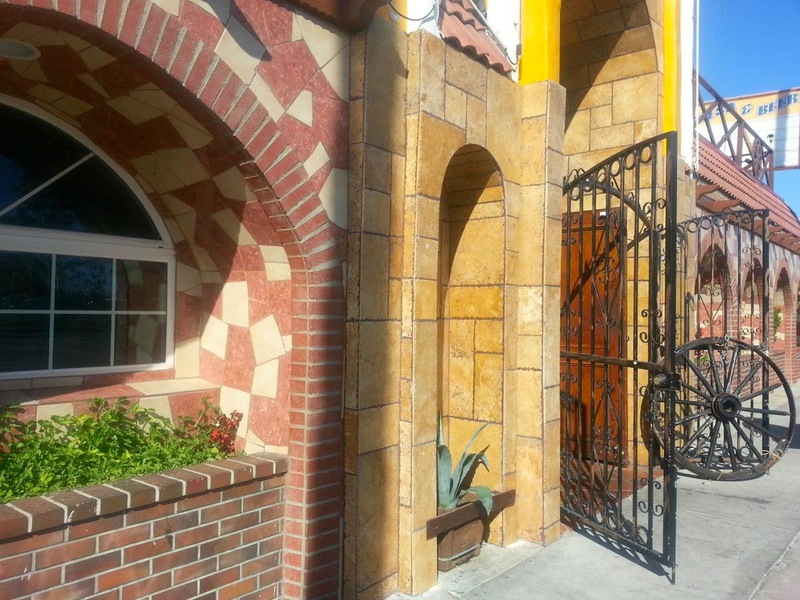 It was rated the #1 Mexican restaurant in all of Los Angeles county this year. That's not just the city of Los Angeles but the entire county. Wow. We had to try it. Yesterday, a friend took my husband and me to Salsa & Beer for lunch. It’s pretty close to his house. I was immediately impressed with the décor. It’s so rustic. I loved the wagon wheel outside the front door. 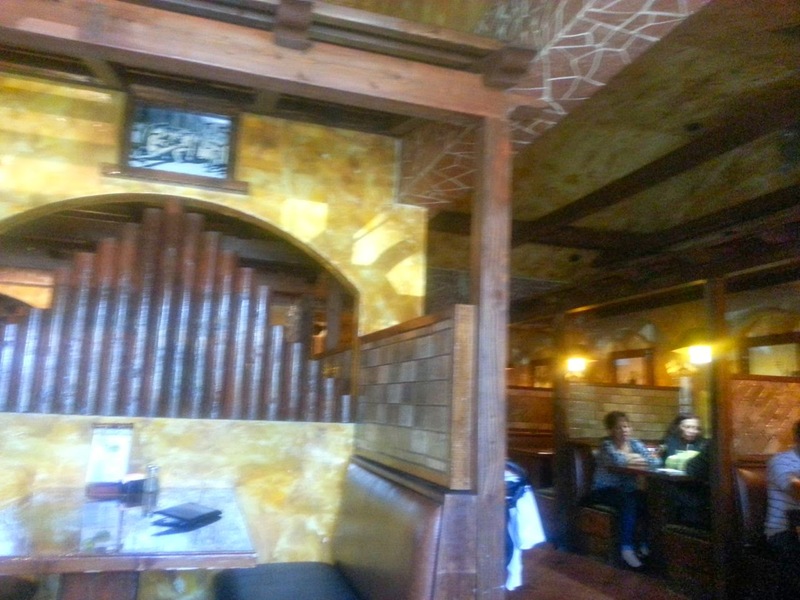 Inside was very rustic as well. It’s definitely the coolest Mexican restaurant I’ve been to in L.A. It was going on 3pm when we arrived, and the place was still pretty crowded. The host led us over to a booth near the windows, and we proceeded to look over the menus. They are big menus. They almost have too many options. I usually like salads, so I thought about ordering a salad, but most of them said iceberg lettuce, so I decided against it. I went for fajitas instead, which is kind of like a hot salad with all the veggies. While we were waiting for our food, they brought out chips and a bean dip. 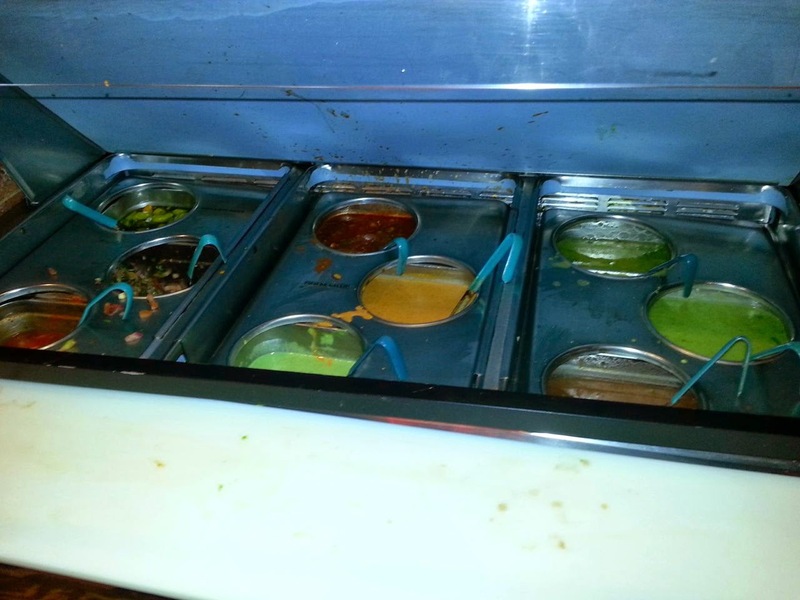 There's also a salsa bar with nine different kinds of salsa. We grabbed quite a few for the table. 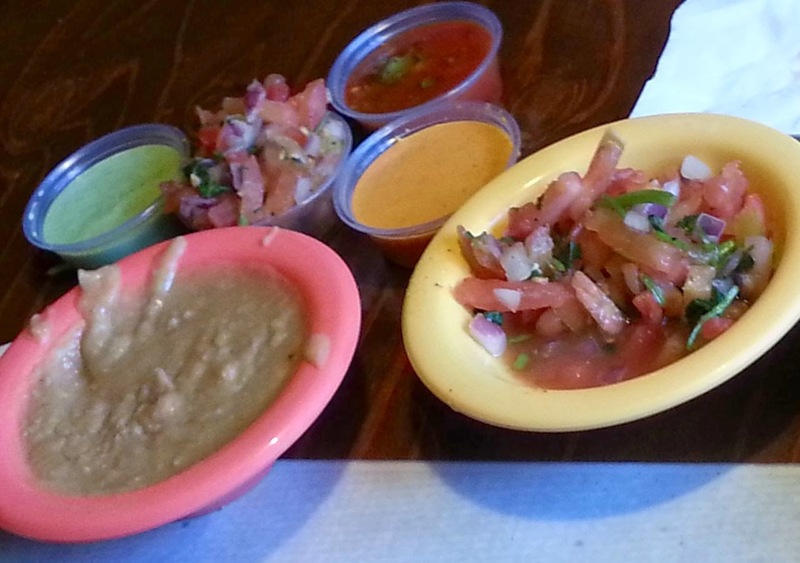 All of the salsa had a little heat to it, which I like, but none of them were as good as the salsa at Chevy’s. 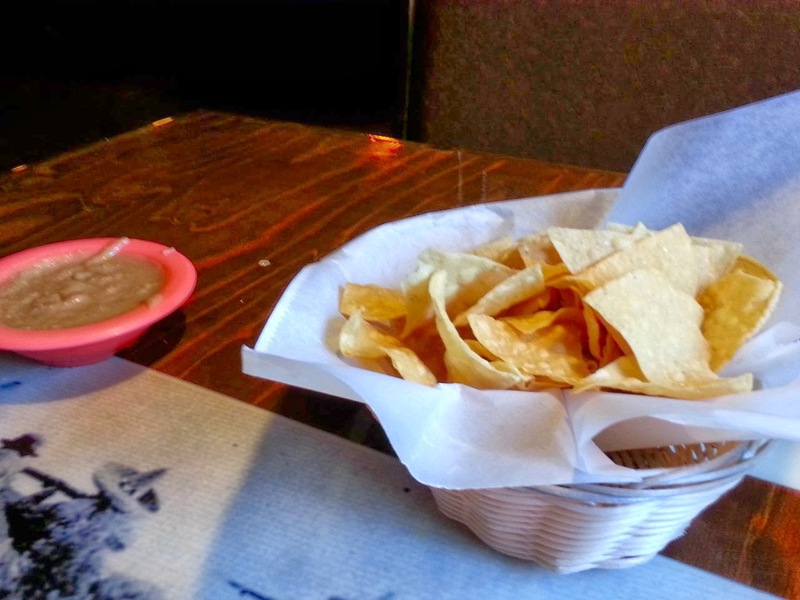 I have to say, Chevy’s wins for chips and salsa, at least in my opinion. They brought our food to our table pretty quickly. We hadn’t even finished one basket of chips yet. I was impressed with the serving size of my order. I had the Guadalajara Spicy Fajitas. 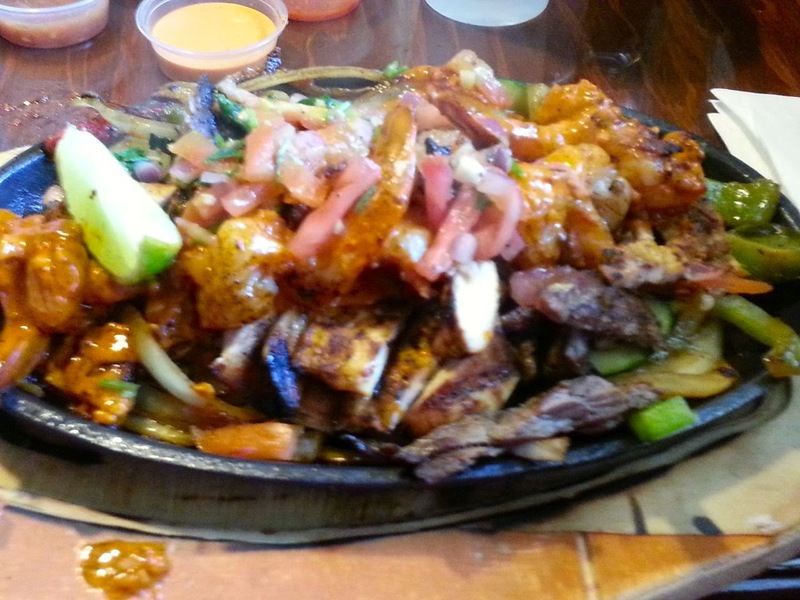 All of the sizzling fajitas (and they certainly were sizzling!) are served with onions, zucchini, and bell pepper. 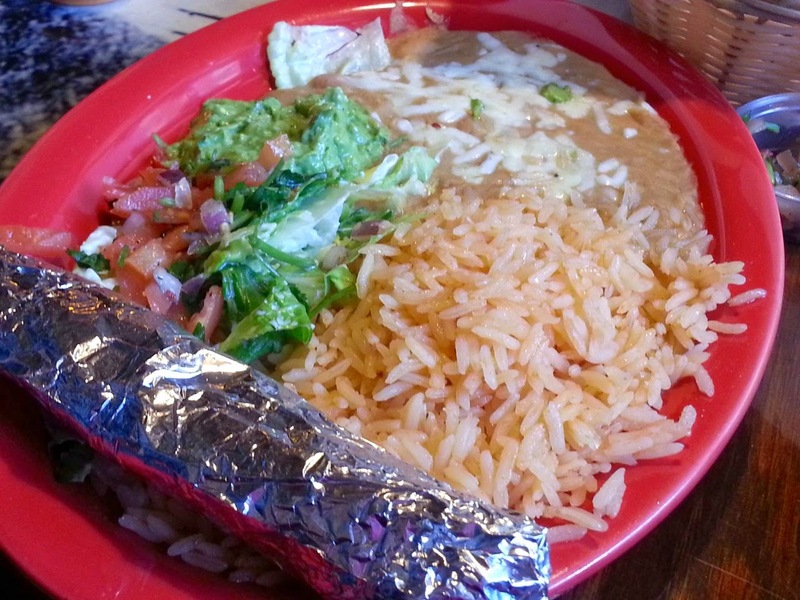 Plus, you get rice, refried beans, pico de gallo, guacamole, and tortillas served on the side. I chose flour tortillas. 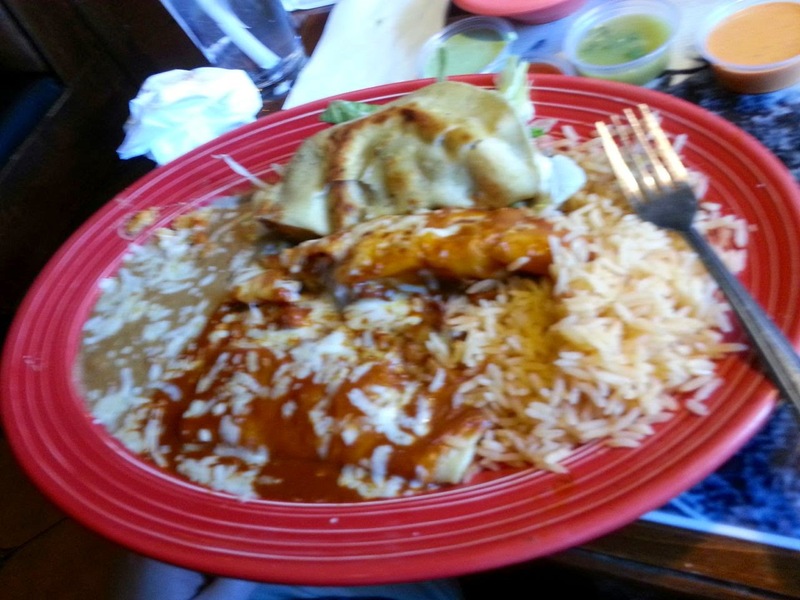 My particular order came with a mixture of chicken, steak and shrimp topped with a spicy chipotle sauce. I mainly ate the fajitas without the tortillas. The shrimp was my favorite. They were big and meaty and especially delicious with the chipotle sauce. The chicken was also good, but I couldn’t even bite through the steak. I would never order the steak again at this restaurant. I loved the veggies. Zucchini was a nice addition that I don’t usually see served with fajitas. I only used one tortilla, and I thought it took away from the flavor of the meat and veggies. The beans were okay. They were refried beans topped with cheese. I’m not a rice person, but it was kinda good when eaten with a bite of beans. I liked the pico de gallo. I let my husband eat the guacamole with the chips. My husband always loves combos at Mexican restaurants, so he ordered Combo #10 which comes with 1 cheese enchilada, 1 tamale, and 1 hard taco. He said the tamale tasted like pork, and the taco was beef. His meal also came with a side of rice and beans. I was really impressed with the size of the taco. I usually don’t see tacos that big at Mexican restaurants, especially when ordering a combo. 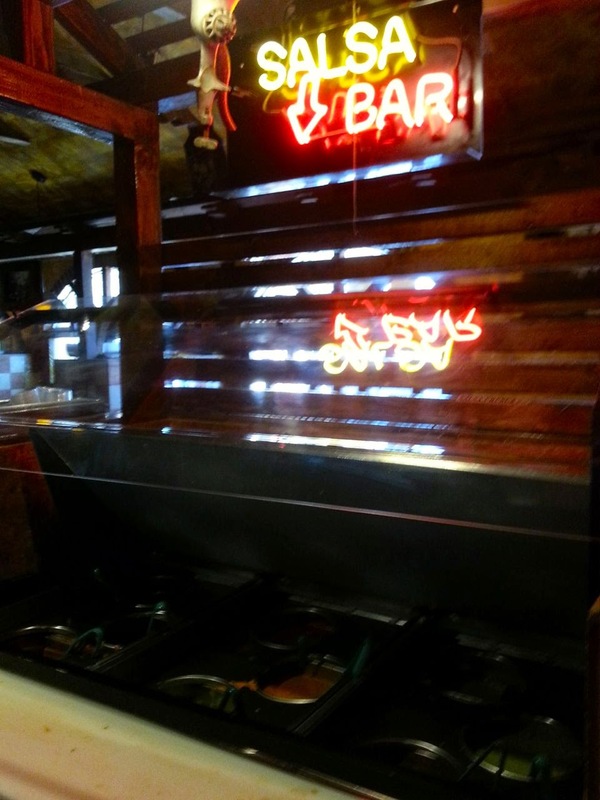 He said everything tasted handmade and authentic, like real Mexican food. This restaurant is now tied with Chevy’s in his opinion for his favorite local Mexican restaurant. Chevy’s feels more like a chain, and this feels more like authentic Mexico, but they both have really good food. His birthday’s coming up, and this just might be where he wants to go for dinner! I don’t remember what our friend ordered. It was some sort of chicken entrée. He said he’s eaten here with his wife several times. He always tries something different, and he’s never been disappointed. 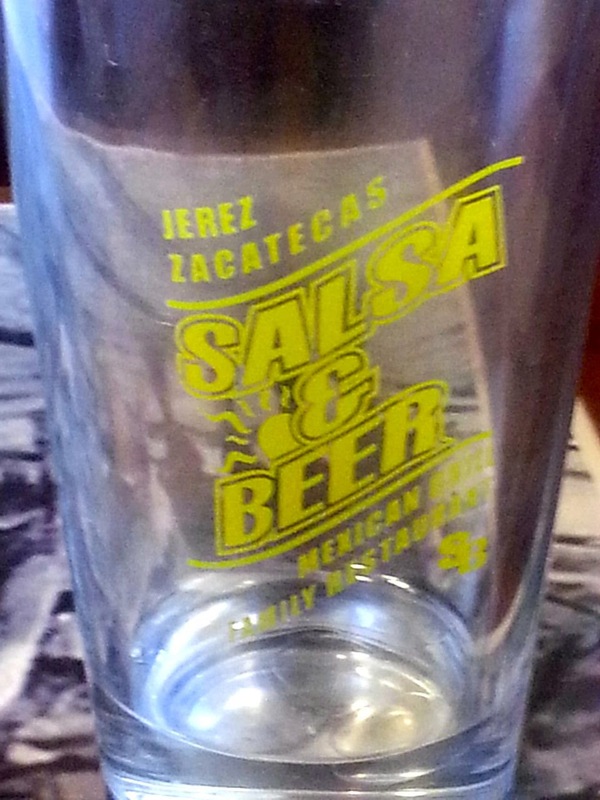 Salsa & Beer, we’ll be back soon!